Not long after the PS40 arrived at the Toolmonger shop, we found ourselves putting a garage door back on track. (Before we noticed that the door was out of adjustment, it caught while opening, twisting and mangled one of the rails.) After we located the parts, we ended up replacing one rail which involved breaking a couple of screws loose and driving two big screws into the door frame. We grabbed the PS40. Our first impressions: the grip is very comfortable. It fits right into your hand, just like the PS20. It’s easy to flip the side-to-side direction switch single-handed, and the trigger is laser-accurate which makes delicate work — like loosening a really stuck small screw — easy. The PS40 feels much like the PS20 as you initally squeeze the trigger to break or drive a screw, but as the effort required increases beyond the PS20’s capabilities, the PS40’s hammer-and-anvil system goes to work. You begin to hear the “clicking” sound familiar to anyone who uses impact tools, and instead of grinding to a halt like even the most powerful small drivers, it just keeps going. We had no problem handling the garage door job (as well as a few others that’d normally require our 18V drill/driver or a larger impact driver) with the PS40. We’ve had a 14.4V Impactor around the shop for some time now, and it’s been a trusty companion for high-torque driving tasks. We use it mainly to drive wood screws — probably the most common task for impact drivers. And after quite a bit of use, we can say that we have surprisingly little need for impact drivers larger than 14.4V. At over 1,000 in-lbs of torque, it’s handled damn near anything we’ve thrown at it. 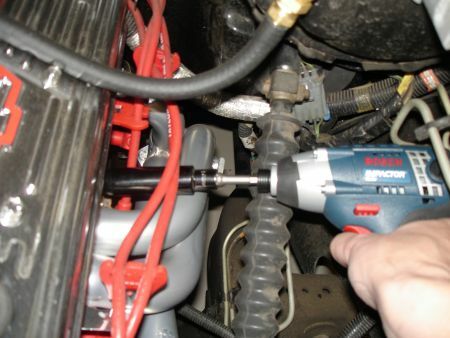 We think of it as our hired gun when it comes to tasks that choke our standard 18V drill driver. Like the PS40, the 14.4V model’s fit and finish is first class. Our only real complaint, ergonomically speaking, lies in the placement of the tool hook. No matter what we were doing, the tool hook always seemed to be in the way. (Of course, we could be biased as we don’t spend a lot of time using the tool belts for which this feature was really intended.) Thankfully the hook can be unscrewed and re-installed on the other side for lefties. We just unistalled it and tossed it in the toolbox. In short, both of these tools are quite easy to use and surprsingly powerful. But how powerful is “powerful?” To make that determination, we needed a test. First, we wanted to drive something absurdly large — something bigger than anything an average user would ever need to deal with. A quick trip to our local big-box netted us the 5/8″ by 6″ screw you see below. Maybe I’m showing my ignorance here, but I’m not sure for what application these screws are intended. Generally when I’m working with something that big, I’d drill and use a bolt instead. But hey — we’re glad they stock ’em because they’re perfect for this test. We also wanted to get a feel for battery life and driving speed, so we grabbed a few hundred self-threading sheet metal screws. We cut out a nice piece of 16-gauge sheet metal and figured we’d put both drivers through the standard Toolmonger “drive ’till you drop” test as well. Read on to page four for our test results. When can I buy it! Hopefully a they will develop a dedicated drill that will fit in the lineup. Nice review. I bought the PS20 after your earlier review and use it most every work day. Does about 75% of the work I need a drill/driver for (right now). I could see how an impact driver similar in size would be handy to have around. Hmm, better show this review to my wife, less than a month to go until my birthday…. I agree with what’s been stated so far. 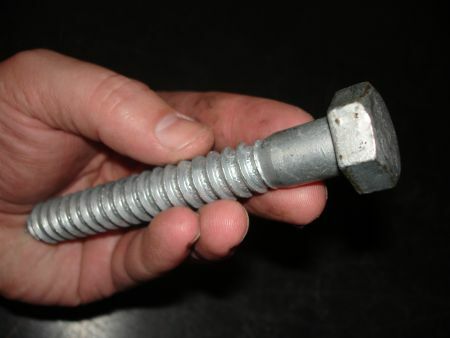 Most of my fastening needs are not the abnormal-sized screws so I think this would be a great addition to my tool box. I would like to see Bosch really (market) the heck out of these 10.8volt tools with a combo set and maybe add a true drill and a flashlight for real cheap. Now I have yet another tool to add to my want list. Any idea when we will start to see these on shelves (or better yet online)? Thanks for great review. I think these would be great for home woodshop or a locksmith. I have used same makita 12v impact for about eight years mostly for sheet metal screws at work but also must have for wood deck screws. Gone through about 3 pairs of batteries, though, and the NMH batteries no better than NiCad in my opinion. The LiIons seem like the way to go and I suspect reason this new COOL driver did so well against its big brother. I must soon replace my makita, but hopefully with a brand with a SYSTEM that includes the flourescent light and blower I cant live without-so I hope at least Makita-(hint,hint)-is listening! I discovered this review while looking for something completely different. A happy mistake. I have a PS-20 and use it constantly. I was thinking of getting a second one to keep on the truck, but one thing stopped me, and that is the torque limits of this unit- it does a fantastic job on all but the longest screws, when it seems to simply poop out. I still find my ancient Makita 9.8v will beat it every time, but can’t compare to the portability. Now I can investigate the new Impactor and make a move. I heartily agree with posts calling for more uses for the 10.8 battery- for one job I adapted it to fit a Black & Decker electric caulking gun (don’t ask!) and it worked great. The annular light is a small but brilliant development, even though I made fun of the PS-20’s wonky one-eye LED, it still is pretty useful I can’t wait to see how much trouble the new one will save. As someone who had first hand knowledge of this and all of the Bosch tools, I can tell you that this tool will be a HOT seller. As a Bosch rep, I sold a ton of the PS20 to HVAC contractors who loved not having to lug their 18V up into the tight spaces. However, I could never get them to get rid of their makita impact drivers. This tool will handle that little issue. I got to play around with the PS40 this weekend at a sidewalk sale. The Bosch rep told me that it was 179.95. Impressive power for its size. I think that it would be great for removing panels . I hope they are going to sell it in a “tool only” option because I already have the PS20. Now if they made a Litheon 10.8 small recip saw that uses jigsaw blades like the old B4050 and 3294EVS inline jigsaw, I would buy one in an instant! I’m still looking for an inline jigsaw with no success. Awesome review of the 10.8V Impactor against its bigger brother. I was quite amazed that someone had taken the time to do such a practical video review on such a new tool. I have been studying the Impactor at Lowe’s for a couple of weeks, and this helped me make up my mind on the purchase. Great review. I will add my two cents to the guys who requested an in line jigsaw. I almost bought the Black and Decker series for this one reason. I hope Bosch will consider adding one to the 10.8 Litheon line. These are great service tools. I wish that Bosch would make a 30 min charger for 12 volt automotive use. I have one for my Dewalt tools and it is a great addition to my service truck.